This chest and back workout is not for the faint of heart. We're going for high reps with moderate weight and very limited rest. Grab your egg timer and let's get to work, son! I see way too many guys wasting hours in the gym chasing the pump. You don't need to do 45 minutes of chest to fill it with blood. I know a better way. Today, we're doing a chest and back workout that's only 25 minutes long. That's plenty of time, trust me. You'll get a sick pump and be so taxed by the end that just sitting upright will be a struggle. The basis of this high-octane workout is kicking out high reps within a specific amount of time. For example, you'd have 4 minutes to finish 50 reps of a given exercise. I call it "time frame training." It was developed by Eric Serrano, MD, the chief formulator of MusclePharm. At first, we implemented time frame training as a workout finisher. Since then, I've molded it into an actual routine. We're going to get into high rep-ranges today, but it doesn't mean we have to go light. Choose a weight that you can lift for 15-20 reps in the first set. If you rip off 30 reps, it's too easy and you need to change your weight. If you're so taxed you're just getting 1 rep at a time, it's too heavy. It might take a couple workouts for you to figure it out. Keep a stopwatch or timer handy at all times. Timing is the basis of the whole training. It's also crucial that you limit your rest. Get a sip of water then get back on the bar. Unless you're both going at the same time, you can't really do this workout with a partner; resting while your partner works is just too much time off for this type of training to be effective. This workout is meant to totally freak your body out. We'll be alternating max reps with high reps, and chest exercises with back exercises. Your body should be at the brink of its ability—go all-out the entire time. I picked weighted pull-ups first to challenge myself right off the bat. I do pull-ups a couple times each week, so weighted pull-ups will give me a pretty serious pump and a serious challenge. Choose a weight you can get for 15 to 20 reps in the first set. From there, you'll probably have to decrease to 8 reps on your second set and then down to 5 reps on your third set. Five minutes will feel pretty long. Your biceps might start to give out, but keep your form tight. You'll start to do a little kip as you fatigue, and that's OK.
You'll feel pretty warm coming off those pull-ups, but it's still a good idea to hit a quick set of 10 reps. Don't count the warm-up reps as part of your four-minute working sets, though. The bench press form I like to use is backed by powerlifting. Take a medium grip, about shoulder-width apart, to keep your shoulder stress down. Tuck those elbows. I see a lot of guys in the gym benching with their elbows way out, like a butterfly. That action just jacks up your shoulders. Keep your form tight and tucked. Once you're through the bench press, you're taxed. 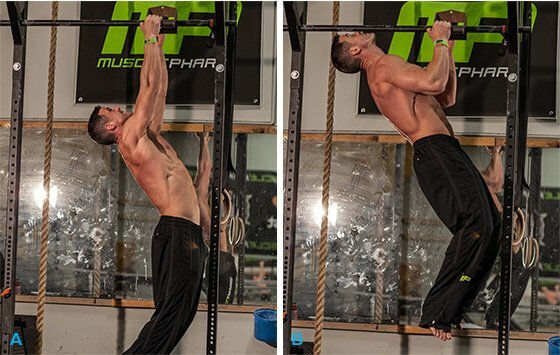 These pull-ups will seriously test your mental capacity for pain. You'll fatigue a little faster, but get through it. Come all the way to the top of the movement and exaggerate the squeeze in the upper and lower back. I've gotten crazy muscularity and striations from doing these. They just take your body out of its norm and blow it up. The key is to set your rep count right. If you can't do these pull-ups, do this bar on pull-down machine. Scale down if you need to. Form and tempo are more important than the weight you pick. Even if you have to shorten the rep count, finish those four minutes. Tailor this workout to suit your level of strength and conditioning. I picked incline dumbbells because I want to get away from the bar for an exercise. I also like doing incline because it's the best mass-builder for your chest. You can bench all day long, but if you want your pec to pop from your collar bone, you have to do incline press. It's a little more difficult to determine weight on this one. Just adjust as quickly as you can. If you pump out 30 reps on your first set, then hurry and adjust. Or, just start over and use those 30 reps as your warm up. Because this is your fourth exercise, you might need the full 20 seconds of rest. If by your third set you're only doing 4-5 reps, you're right on with the weight. It's the first time we've done two exercises of the same muscle group back-to-back. Your chest will be toast, so don't break your nose. Keep your back tight and see what you've got left. Keep your hands about shoulder-width apart. I don't lock my elbows at the top of the movement because I want to keep as much pressure on the muscles as possible. Completing three minutes of push-ups should feel damn near impossible. That's what we want. Get as much blood into the chest as you can.